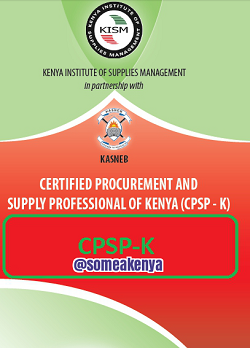 The CPSP-K curriculum/exam is designed to equip learners with knowledge, practical skills and attitudes that will enable them perform duties as buyers, supply chain managers,supervisor directors, or consultants for organizations. How much is the whole CIPS package? Kindly let me know the cost for the three units. please advice how soon I can get those KISM CPSPK notes and revision Kits, if there is any payment to be made also let me know. I need the following CPSP-K notes and revision kits in softcopies.